Imogen's Typewriter. : Book Review: Not Your Average Nurse by Maggie Groff! Book Review: Not Your Average Nurse by Maggie Groff! My non-fiction shelf is dominated by medical memoirs; be it a doctor from the 1800s or a midwife from the 1950s, I can't get enough of the mix of medicine and drama. So when the opportunity to be on the blog tour for Not Your Average Nurse by Maggie Groff* came up, I jumped! Based in the 1970s? Covering student nursing? In London? It sounded right up my alley, and I couldn't wait. To a young girl the life of a student nurse sounds exciting, but with long hours and short shrift it's never easy. 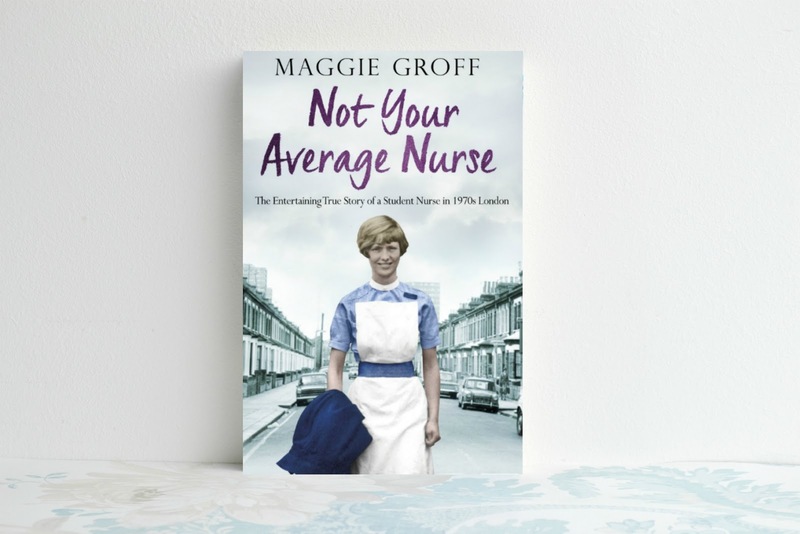 So when Maggie Groff embarks as a student nurse at London's King's College Hospital she must quickly get to grips with the demands of her chosen career. It's sink or swim. In a delightful romp through time, played out against the march of feminism and the fashion, music and movies of almost half a century ago, we follow Maggie's highs and lows as with trial and much error she becomes a highly skilled nurse and sets sail for a new life in Australia. From the watchful gaze of stern ward sisters and the ordeals of nursing at a poor housing estate to becoming an industrial nurse at the iconic Sydney Opera House, Maggie shares her stories of mistakes and mayhem, tea and sympathy, and the life-affirming moments that make it all worthwhile. This book is a wonderfully written memoir covering 1970 to 1985 and has some brilliantly written parts, as one would expect from an award-winning novelist. What I didn't expect was to be whipped away to Switzerland, Australia and Ibiza, and to be shown the differences between hospital nursing, industrial nursing and even elderly nun nursing. All while staying pretty charmingly British and cosy to read. Maggie Groff has had a truly amazing life. She shows the up and the downs of nursing- and life at the same time. While I don't think I could handle the night duty and the emergencies, I'm totally jealous. I was quite close to looking into a nursing career while reading! But I think what this memoir really shows is what you can do with a strong attitude and determination. Maggie Groff knew what she wanted and she did it, be it quitting an underpaying job or flying out to live across the globe all alone. The comparison to Call the Midwife has to be made because they're both memoirs about UK based nursing in the past, although set 20 years apart. I get the same comforting feeling I get from the books, and the slightly-less-so-but-still-there judgement of women by their appearance, but Maggie Groff has had a much more varied career. If you liked one, I think you'd like the other. One thing I did raise my eyebrows a little at the one racist paragraph, where she tells the reader about a rumour implying the Chinese nurses were eating ducks from the park; "I never believed the rumour, especially as I had started it." It was obviously the 1970s and we all say things when we're young, but this was never addressed again which is unfortunate. Overall though, this is what it says on the cover, an entertaining true story of a student nurse in 1970s London. And so much more. Prepare to see the effects of Feminism in nursing, a family lose a mother to cancer and a great balance of a polished story and the raw real-life events. If you want to read it, you can pre-order here for it's release on Wednesday. And there will be more blog tour posts from Kelly, Dee, Jo, Lorraine, Carly and Adele during the week! "It wouldn't matter if he was a thief or a prince. Everyone who walks through the hospital doors receives the same respectful treatment. It's what underpins King's, Maggie. It's what's right." Where do you put memoirs on your shelf; fiction or non-fiction? Will you pick this one up? *I was provided a copy of the book for the blog tour, this hasn't changed my opinion.